Stretch rejuvinator ,for the life of your vinatge stretch arsmtrong figure . Also comming soon Stretch Rejuvinator Turbo! A slightly heavier more oily silicone oil created for those stretch figures and latex that has dryrot,discoloring from uv rays or is brittle.This is the strongest formula for latex available. Also Sold on my ebay store !! If you already tried Stretch Rejuvinator,you know just how amazing this stuff is,but now can you imagine an even better ,richer long lasting formula? Well After years of reading and searching for knowledge of exactly what chemicals not to use on your vintage arsmtrong figures,I have come up with the very best formula you are sure to love.Now one application of SR lasts even longer and if stored inside a plastic zip lock bag as I metion in my preservation page,an application will last indefinintly keeping your stretch figures latex skin pure,soft and stable for ever!!! And although my cost has drastically increased with this new improved formula,I have managed to keep the price just about the same for my fellow Stretchys by shareing the increase cost.Afterall,its not always about the money.I have been fortunate to take part in preserving these few remaining and fine vintage stretch figures and seeing satisfied collectors all over,This my friends is what its all about. 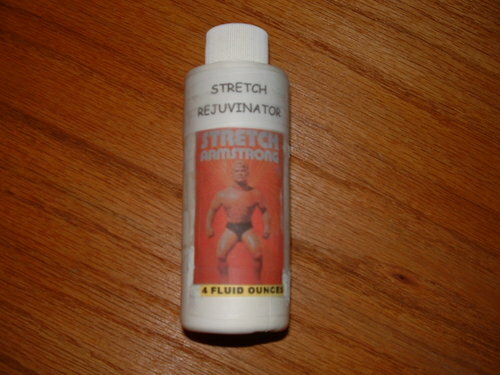 Applying Stretch Rejuvinator is one of the 4 steps I have devised to preserve your Stretch Figure for a lifetime of worry free enjoyment. In fact, Stretch Rejuvinator is the number one most important of the four steps. Stretch Rejuvinator is a pure Silicon based solution made just for latex and will not only preserve your stretch figure but it will also rejuvinate the skin making it much more supple. Rejuvinator will also produces a magical protectve shine that will bring your stretch back to life. Make no mistake, Stretch Rejuvinator is the only way to go. Do not use any automotive or leather sprays on your stretch. These sprays have harmful chemicals not made for latex and will surely send your stretch to an early grave. Stretch Rejuvinator will help protect the skin from harmful UV Rays,Human skin oils, and Dirt. It will also seal the microscopic poors in the latex keeping air out which will help maintain a nice soft syrup. Works especially well on Stretch X Rays because it will actaully help remove the cloudy dullness that many of the X Rays have making it nice and clear again.I have been using Stretch rejuvinator on all my Stretch Figures for over 10 years and they all look like new. You will love this stuff, I garuntee it or your money back! there are 2 ways you can order! Order off this website and send $25.69 to paypal using email adress willabeee@yahoo.com PLease be sure to indicate "Stretch Rejuvinator" in the paypal message area. Or click on the picture to the right and it will take you to my Ebay Store where you can purchase a bottle for $26.99.Both prices include Shipping in the USA.One bottle will last a lifetime for each stretch figure as you only apply one even coat only 2 times a year. Keep your Vintage Stretch Figure in tip top condition and Rejuvinate before its too Late! You get one 4 ounce spray bottle of stretch rejuvinator!